Well, it is that time of year when a couple of things are happening in our lives that require a little extra attention. First off, the holidays are right around the corner. And for many, we can easily veer off course when it comes to eating healthy, getting an adequate amount of sleep, and exercising regularly. We just get so busy that often times some of those important things fall to the way side and that can throw our bodies into a funk. Another thing that affects us is an increase in the amount of viruses we are exposed to. If we are already in a compromised state, certainly being exposed to viruses is the last thing we need. So what can we do to help combat these issues? Being committed to making wise and healthy choices for ourselves is our first step. Good nutrition, sleep, and exercise are all things that deserve a top spot in our daily routine. Being realistic though, it can be tough and often times we could use an extra boost. Recently, I received some samples from Amazing Grass. Perhaps you have heard of them, or maybe you haven't. And if you haven't, chances are you will start to notice their products being sold all around you. Costco, GNC, Whole Foods, and New Seasons are a few of their retailers. You can also order directly from their website. Let me tell you a little about this company. Their nutrient rich grass actually comes from a farm, not a factory! They harvest their grass at the peak of its nutrition to ensure their customers are getting the maximum benefits. Their products are USDA organic, Non-GMO, kosher pareve, vegan, and gluten-free. Not only do their products contain a healthy amount of vitamins and minerals, they also contain plant based protein, phyto-chemicals, digestive enzymes, and probiotics. Doesn't that sound exactly like the boost our bodies could use? Something I really like about these products is the multitude of ways you can incorporate them into your meals. My favorite way to enjoy the Amazing Grass greens is in a smoothie. I'm fond of smoothies because they can easily be tailored to your taste preferences. It's one stop shopping. By adding one nutritional benefit after another, you have yourself a nice tall glass of massive health benefits. You know your body loves that! Aside from smoothies, Amazing Grass can also be incorporated into your baking, soups, salads, desserts, snacks, you name it. Visit their recipe page for more ideas. But there is one more bit of good news for you. If you are short on time, simply stir the Amazing Grass greens into water, milk, juice, etc., and enjoy! You don't have to make a recipe out of it to reap the benefits. The recipes I'm sharing with you today include Green SuperFood Alkalize Detox and their Amazing Grass Chocolate Raw Reserve. The detox blend has alkalizing and detoxifying properties to restore your pH balance and rid yourself of toxins. Spinach, parsley, garlic, ginger, turmeric, lemon peel, and fennel seed are just a handful of ingredients you will find in this detox blend. The Raw Reserve line of products is also impressive as it contains spirulina, chlorella, and sea vegetables all of which are known to aid in healthy organ function, help to build our immunity, and serve as detoxifying agents. Raw Reserve offers 14 grams of non-soy plant based protein and 25 billion probiotics. I have carefully selected ingredients in both recipes to enhance the health properties and nutritional benefits the Amazing Grass powders offer. 1. Place ingredients in your high speed blender and blend until smooth. Each recipe makes one serving. Both smoothies offer similar benefits but differ in some ways. If you are looking for a nutritious detox, you know which one to choose. The alkalize and detox smoothie will help to restore your pH balance and remove toxins. It has a nice, citrus taste that is refreshing and gives you that good cleansing feeling. 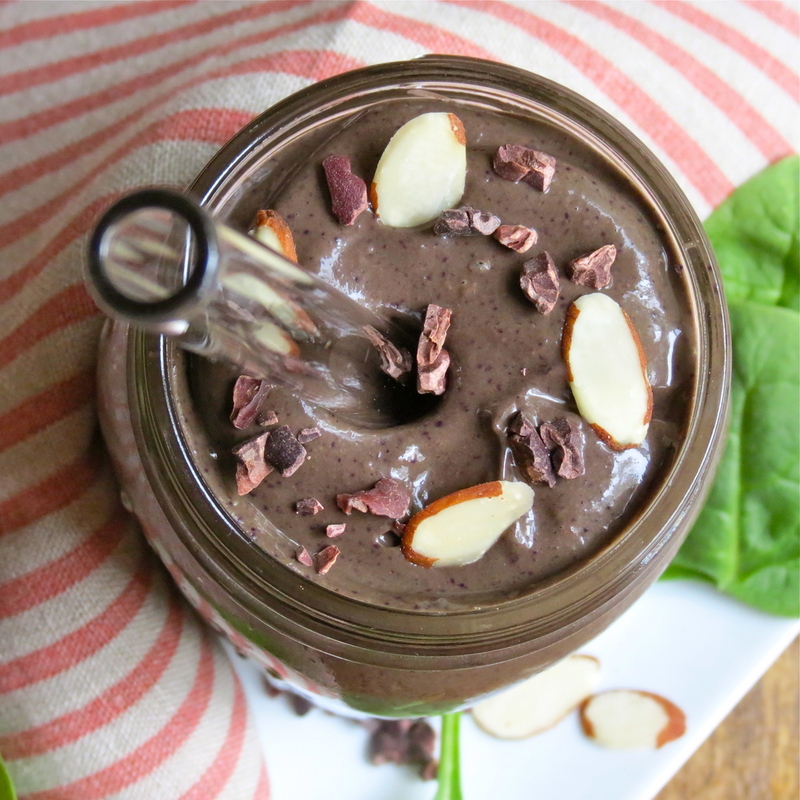 If you are looking for a load of greens and protein, turn to the chocolate almond smoothie. It is super creamy! You could pour it in a bowl and eat it with a spoon. It almost reminds me of chocolate pudding! Even though they differ in taste and some of their health benefits, they are both equally nutritious and DELICIOUS! So enjoy and here's to a healthy fall and winter season!